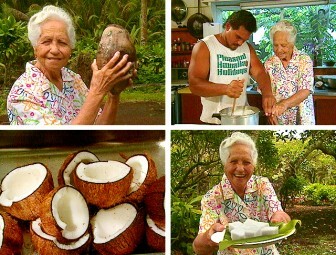 Assisted by Sammy Keliihoomalu, Helen shows how to select and husk the coconuts, demonstrates old and new ways of grating the coconut and cooks up the ingredients on the stove. While waiting for the haupia to cool, she reminisces about her younger days in Puna. Videotaped July 19, 1990, while lava flows were covering nearby Kalapana homes.